Sometimes all you need is a good cannabis powder fertilizer. Powder fertilizers are easy to use and store. They are also easy to measure so you always have the correct dosage. Each bag of our Grow and Bloom formula has over 40 applications. Buy your combo today and be prepared for lusher healthier plants. Vegetative plants and flowering plants have very different nutritional needs. While a plant is growing, it requires plenty of nitrogen. Nitrogen helps with the growth of new stems and leaves. This results in a bushy plant that can efficiently metabolize UV rays. 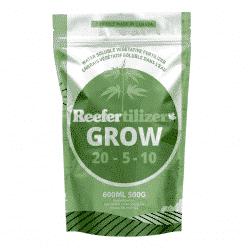 Our Grow fertilizer is formulated to give your plants the nitrogen required, as well as various micro nutrients proven to aid cannabis growth. 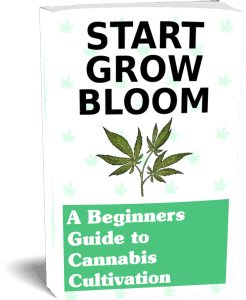 A flowering plant is no longer focusing on overall growth, it is now putting energy into developing flowers. These flowers will eventually turn into buds, so a steady diet of nutrients is necessary. Phosphorus, potassium, magnesium and calcium are the heavy hitters at this stage of growth. Having ample amounts of each will result in large dense buds with amazing aroma. A lot of commercial fertilizers accomplish this with several products, we like to do it with one. Our fertilizers are easy to use and will go a long way. A perfect gift for the grower in your family. They are ideal indoors and outdoors, and can be used in hydroponic systems. 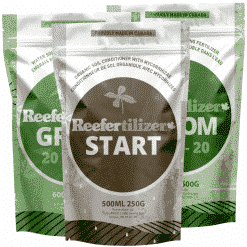 Reefertilizer™ Bloom cannabis powder fertilizer is the final step of our nutrient and fertilizer program. By introducing calcium – as well as increasing the amount of phosphorus and magnesium available to your plant – Reefertilizer™ Bloom will encourage impressive bud growth. Dense, juicy and tasty buds are most certainly guaranteed. 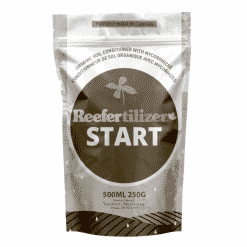 Reefertilizer™ Stage 3 formula will help your plants realize their full flowering potential. 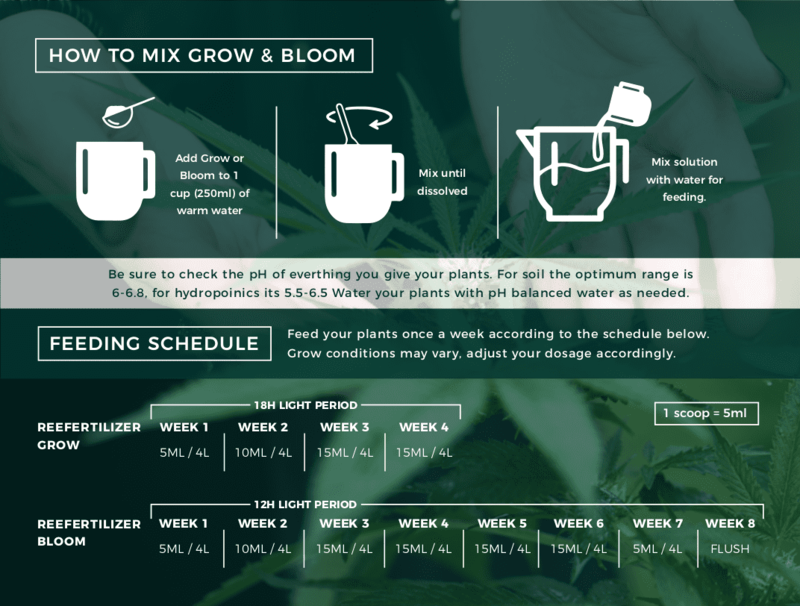 Early Bloom Phase – 1-2 scoops (5-10 ml) per 1 gallon (3.75l) of water for each feeding. 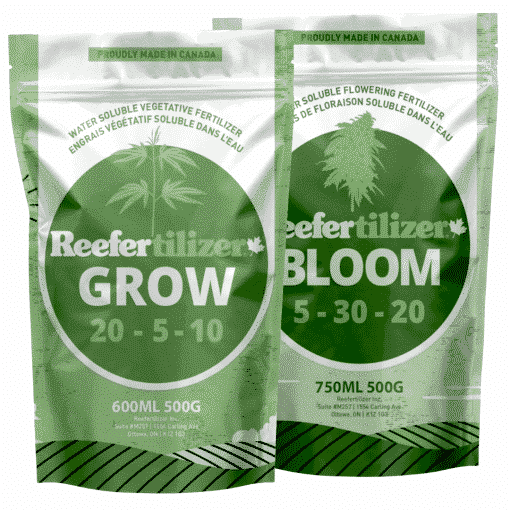 Full Bloom – 2-3 scoops (10-15 ml) per 1 gallon (3.75l) of water for each feeding.